50+ installations around the world. 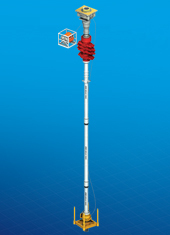 Our system allows a subsea well to be drilled from a jack-up in 5K, 10K and 15K applications, offering significant savings over a semi or floating MODU. See Merlin HP riser system animation here. Fast makeup and slimline connections keep weight to a minimum. Non-rotational connections allow the use of flexible control lines. Through-rotary solutions available dependent on size. Rental options available to reduce inventory after project.